RIFT VALLEY, Kenya , Dec 21 2012 (IPS) - Runners Hosea Nailel and Julius Muriuki, who are from Kenya’s rival ethnic Kalenjin and Kikuyu communities respectively, met during a half marathon when they broke away from the pack and remained in the leading group. They shared water during the race and tried to outdo each other at various sections of the last stretch. They did not talk; they only tried to outrun each other. Having met for the first time at the newly-inaugurated Menengai Half Marathon in Nakuru Town, Rift Valley Province in November, Nailel and Muriuki have become friends and want to become training partners. It is particularly poignant in a country where the Kalenjin and Kikuyu communities from the Rift Valley Province have been involved in deadly ethnic clashes almost every election year since 1992. The worst of it was in the 2007-2008 post-election violence, in which over 1,300 people were killed, 3,000 women were raped and more than 600,000 people were displaced, according to a report by the government-appointed Commission of Inquiry into Post-Election Violence. Nakuru County in Rift Valley Province was considered a political hotbed during the 2007-2008 election violence. And tensions are flaring in the country again ahead of the 2013 polls. This month the investment group Old Mutual Kenya said that ethnicity would also play a role in the upcoming elections.Recently inter-ethnic violence has flared in this East African nation over competition for resources. On Sep. 9, 38 people were killed in revenge attacks in the Tana River Delta district of Kenya’s Coast Province. The deceased include eight children, five women, 16 men, and nine police officers. In August four people were killed in a separate incident in Muradellow village in Mandera North, in North Eastern Province. Police said that the conflict occurred at a water point where herders had taken their animals. In March, 22 people were killed in Mandera, in North Eastern Province. More than 1,500 people fled their homes as a result of the violence, which occurred in El Golicha village, close to Kenya’s border with Somalia. But ethnic differences mean little to the two talented runners. “I met Muriuki and several other athletes from Central Kenya at the marathon. I did not know him before, but since then we have been in communication, and we shall meet soon. We plan to train together and compete in a forthcoming half marathon. As athletes we shall use our talent to demonstrate unity,” Nailel, who comes from Eldoret town in North Rift Valley, which also experienced ethnic violence after the country’s 2007 election, told IPS. Nailel, who placed sixth in the Paris Half Marathon in October, led a squad of runners from North Rift Valley to join over 2,000 participants in Nakuru Town in a race that aimed to bridge ethnic divisions ahead of this country’s March 2013 elections. “Such races will definitely unite different communities and eventually the nation; Kenyans are known for uniting behind their sportsmen and women,” Nailel said. Muriuki lives in Nyahururu, a town in Central Province, and is an up-and-coming runner. “They are great runners,” Muriuki said of Nailel’s team. “They helped me improve my speed, it was a united race and we raced together to the finish line. I am in communication with Nailel and some of the other runners and I look forward to meeting them at the next race,” Muriuki told IPS. Muriuki had appeared strong throughout the race but Nailel broke away at the finish and clocked 61:02 to win the half marathon with Muriuki coming in fourth. Muriuki was the only runner from Central Province who finished in one of the top 10 positions in the race, while Nailel’s team registered a convincing victory by scooping all the other positions. Nailel and Muriuki hope that running will help melt the differences of their respective ethnic groups. “It was very encouraging to see residents of Nakuru Town line up by the sides of the roads to cheer us on as we passed through the streets. 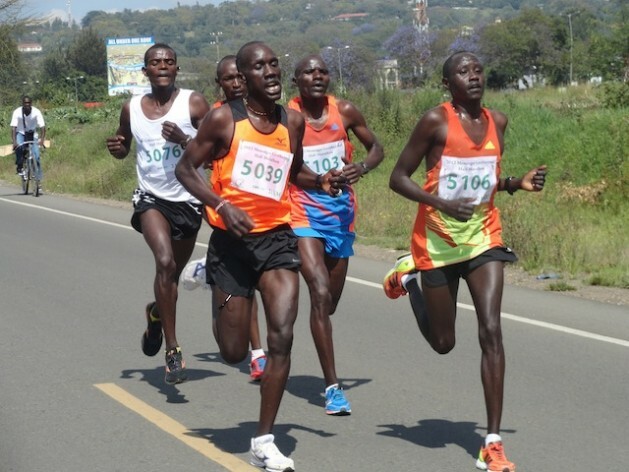 We felt encouraged and part of Nakuru despite it being our first time participating in a race in the town,” said Nailel of the majority Kikuyu community in Nakuru Town. Both he and Nailel talk about finding a suitable place to train together. They think that Nakuru Town, where they met, could be a possible training ground because of its strategic location between their home towns. They also discuss visiting each other regularly. Their show of unity is encouraging to others. Athletics Kenya secretary general David Okeyo said that athletics was one of the most practical ways to build unity among communities ahead of the country’s March 2013 elections. “There are hundreds of upcoming (runners) from different communities who can do more than just run, they can unite communities, if we bring them together like we did in Nakuru,” he told IPS. Okeyo said that races like these were very important in areas like Nakuru County and the entire Rift Valley Province where the 2007-2008 clashes occurred. Nakuru North District Commissioner Michael Kagika said that participating in races was a rare opportunity for athletes to use their sporting talents to unite, and to mend their differences. “The marathon is a major step towards building and sustaining peace among communities living in Nakuru County and Rift Valley Province. It brought different cultures and communities together and it came at a time when Kenya is poised to hold the general election,” Kagika told IPS.